"... a carnival atmosphere descended on the square, where vendors offered food at discount prices and protesters posed for pictures in front of tanks scrawled with slogans like, '30 years of humiliation and poverty.'" 30 YEARS of humiliation and poverty. Notoriously brutal secret police. Elite capture. Enough frustration to push your way across a bridge guarded by hundreds of cops willing to turn a water cannon on you. We often talk about development, its constraints, and the various political, economic, and historical forces which result in countries being "developed" or not. Sometimes those conversations can get very abstract. It's worth remembering that being in a typically underdeveloped, undemocratic country means dealing on a day to day basis with issues so debilitating and frustrating that you're motivated to spray paint your grievances on the side of a tank. 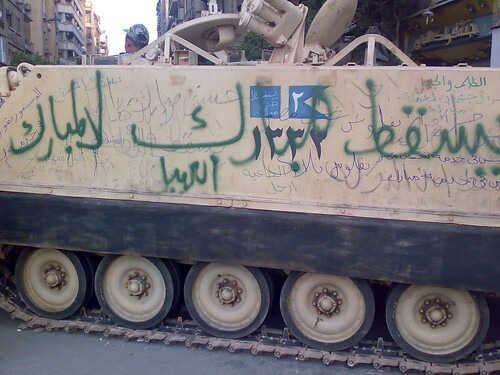 *Note: the graffiti on the side of the tank says "Down with Mubarak," and comes from Ramy Raoof's flickr stream, here.